To Buy or Not to Buy a B2B Email List: What Could Go Wrong? The CEO wants results and doesn’t care how you get them as long as you don’t leave the company exposed! Some of you reading this – if not most – would be inclined to buy a list. That’s understandable, as it can be done in just a few clicks. But before you make that purchase, be aware of the substantial risks involved as well as the existing options you have that will get the job done for you without making your CEO nervous (or liable). What’s wrong with buying a B2B email list? Here are three common email list fails for which you could be held responsible (through no apparent fault of your own) and their potential penalties. 1. You could violate the USA’s CAN-SPAM law. In spite of what some B2B marketers believe, CAN-SPAM applies to B2B email marketing as well as B2C. If you send a commercial email of a promotional nature, it’s covered. Complying with CAN-SPAM is not difficult, and it doesn’t mean that you can’t send promotional messages to people you don’t know. It does mean that you have to follow certain basic rules, including monitoring what others do on your behalf. Buying a list from someone else or retaining them to send your email doesn’t shield you from the law. Typically, purchased lists are littered with bad email addresses that could automatically trigger a SPAM report. What’s the big deal? Every CAN-SPAM violation is subject to a fine of up to $16,000 – per email address. That’s the kind of exposure your CEO doesn’t want. They also don’t want you to take my word as legal advice. See the Federal Trade Commission’s CAN-SPAM Compliance Guide for the full story. 2. You could violate Canada’s new anti-SPAM law (CASL). The rules of email marketing in Canada changed on July 1, 2014. CASL is the strictest anti-SPAM legislation in the world, but the B2B email marketing sky isn’t falling and you can still send promotional emails to and from Canada. Just make sure you follow the rules. Topping those rules is that you have to get permission before sending someone a promotional email. Plus, you have to keep track of that permission. How can you be sure that none of the email addresses on that purchase list you’re considering are in Canada? Because you ordered US addresses only? Because the list broker told you so? Because none of the email domains ends in .ca? Sorry, none of those ‘because’ excuses will keep you from getting pinched when your promotion lands in Canadian email accounts. With corporations facing fines of up to $10 million for sending non-consented emails, that’s an awful big pinch to risk. Here’s a plain language guide detailing how CASL applies to businesses and individuals. 3. You could be blacklisted. Imagine all of your customers with Gmail, Hotmail, or Comcast accounts being blocked from your email. It happens. The major free email providers and ISPs track what comes into their servers. When a lot of old email addresses that haven’t been used in years start arriving from one sender, they seal the mailboxes to that sender and report them to blacklist reporting services. Inexpensive email lists are full of such junk email addresses. They set off alarms, potentially resulting in your email being blacklisted. The penalty you pay is inability to contact your customers and prospects. How expensive would that be? There are lots of email list growth hacking tactics. Here are three of them to jump start your list building. 1. Look for trusted industry associations in your niche that will send your email to their membership for a fee. You won’t own the list, but you will reach many of the people you’re targeting with confidence. Be sure to include a strong CTA (Attend this webinar, Get this great Analyst report, etc.) to convert recipients to subscriber to your content. 2. 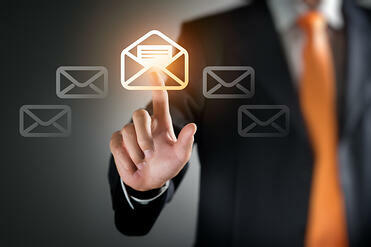 Encourage your subscribers to share your emails. How? Ask them. First, include social sharing buttons that make sharing easy. Second, put a message in the email asking people to forward your message to people they know who would find it informative. Include a ‘Subscribe’ link back to your website for those recipients. 3. Work with strategic partners to cross-promote your content. Where you and your partners have jointly developed programs, it is a perfect opportunity for both companies to gain reach (and increased visibility) among each other’s opt-in list. But – do this cautiously, with content that is clearly relevant to your audience. Otherwise, you’ll be back in the same hot water with regulators. As for how to create an email that promotes that killer offer properly, download our free E-Guide, The Must Have Guide for Highly Effective Emails.